Equipment: a stiff ruler (12″ or more) with legible,1/8″ divisions, a pen, and a notebook. 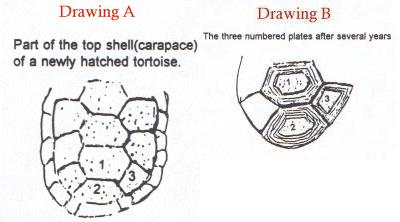 The length of the upper part tortoise shell (carapace) is the commonly used dimension when referring to tortoise size. The measurement is a straight line, not over the curve. The following describes how to measure for approximate length if calipers are not available: Place the rear end of the tortoise against a wall without molding as shown in Figure 1. Lay the ruler along the length of the shell, in the mid-line, making sure that both the back of the carapace and the “low” end of the ruler are touching the wall squarely. Look directly down at the middle of the front edge of the small scute(scale) that is in the center of the front edge of the shell. Sight straight down (at right angles to) where the appropriate marking on the ruler is over that place on the scute. See Figure 2. As you grasp the ruler at the free end, place your thumb nail on the measurement and hold it there while you lift the ruler to read the length. When a tortoise hatches, it has no growth rings on its shell. Each year, none to several rings are formed around each plate of the shell depending upon the quantity and quality of forage available. This, in turn is dependant upon rainfall. For this reason you cannot tell a tortoises’s age by counting the rings on the plates.